1/10oz Krugerrands are an excellent way to boost your holdings with fine gold. The South African Gold Krugerrand was famously one of the very first bullion coins made for investment purposes. From their debut in 1967 until 1979, only the popular 1oz coin was available. However, by 1980, the Gold Krugerrand was so commercially successful that it accounted for 89% of the gold bullion market. This in turn prompted South Africa's Rand Refinery to issue three additional sizes, including the very affordable 1/10oz Gold Krugerrand. The introduction of the 1/10oz Gold Krugerrand opened the market to a new breed of buyers. Fractional coins are much more affordable than their larger counterparts and allow younger or less established investors to enjoy all the same features that make the Krugerrand an international icon. Each coin is struck from 22 carat gold (.916.7/1000 purity) and features the famous springbok reverse design. The springbok antelope is one of the country's national symbols and is recognised around the globe. The obverse of the 1/10oz Gold Krugerrand is no less enticing. Each coin bears the image of Paul Kruger, the founding father of the Republic of South Africa along with the inscriptions "SUID AFRIKA" and "SOUTH AFRICA". Unlike other legal currency bullion coins, the Krugerrand doesn't carry its denomination. 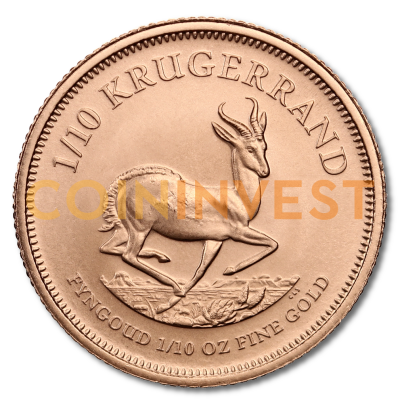 The 1/10oz Krugerrand is a smart choice for investors; it’s affordable, portable, and infinitely tradeable. Its history and unique design features add to its overall value. Order 1/10oz Gold Krugerrands with CoinInvest and add a truly remarkable coin to your collection or portfolio. We supply Krugerrands from various years and all orders are fully insured for secure shipping.